before Mowgli goes to live among men, some time after “Kaa’s Hunting”. Forgoing thought of quest or kill. The fangs that tore his father’s throat. The rain that breaks our Water Truce. he Law of the Jungle--which is by far the oldest law in the world--has arranged for almost every kind of accident that may befall the Jungle People, till now its code is as perfect as time and custom can make it. You will remember that Mowgli spent a great part of his life in the Seeonee Wolf-Pack, learning the Law from Baloo, the Brown Bear; and it was Baloo who told him, when the boy grew impatient at the constant orders, that the Law was like the Giant Creeper, because it dropped across every one’s back and no one could escape. “When thou hast lived as long as I have, Little Brother, thou wilt see how all the Jungle obeys at least one Law. And that will be no pleasant sight,” said Baloo. This talk went in at one ear and out at the other, for a boy who spends his life eating and sleeping does not worry about anything till it actually stares him in the face. But, one year, Baloo’s words came true, and Mowgli saw all the Jungle working under the Law. “No. The foolish water is going all away, and I do not wish to break my head,” said Mowgii, who, in those days, was quite sure that he knew as much as any five of the Jungle People put together. That spring the mohwa tree, that Baloo was so fond of, never flowered. The greeny, cream-coloured, waxy blossoms were heat-killed before they were born, and only a few bad-smelling petals came down when he stood on his hind legs and shook the tree. Then, inch by inch, the untempered heat crept into the heart of the Jungle, turning it yellow, brown, and at last black. The green growths in the sides of the ravines burned up to broken wires and curled films of dead stuff; the hidden pools sank down and caked over, keeping the last least footmark on their edges as if it had been cast in iron; the juicy-stemmed creepers fell away from the trees they clung to and died at their feet; the bamboos withered, clanking when the hot winds blew, and the moss peeled off the rocks deep in the Jungle, till they were as bare and as hot as the quivering blue boulders in the bed of the stream. The birds and the monkey-people went north early in the year, for they knew what was coming; and the deer and the wild pig broke far away to the perished fields of the villages, dying sometimes before the eyes of men too weak to kill them. Chil, the Kite, stayed and grew fat, for there was a great deal of carrion, and evening after evening he brought the news to the beasts, too weak to force their way to fresh hunting-grounds, that the sun was killing the Jungle for three days“ flight in every direction. And the heat went on and on, and sucked up all the moisture, till at last the main channel of the Waingunga was the only stream that carried a trickle of water between its dead banks; and when Hathi, the wild elephant, who lives for a hundred years and more, saw a long, lean blue ridge of rock show dry in the very centre of the stream, he knew that he was looking at the Peace Rock, and then and there he lifted up his trunk and proclaimed the Water Truce, as his father before him had proclaimed it fifty years ago. The deer, wild pig, and buffalo took up the cry hoarsely; and Chil, the Kite, flew in great circles far and wide, whistling and shrieking the warning. By the Law of the Jungle it is death to kill at the drinking-places when once the Water Truce has been declared. The reason of this is that drinking comes before eating. Every one in the Jungle can scramble along somehow when only game is scarce; but water is water, and when there is but one source of supply, all hunting stops while the Jungle People go there for their needs. In good seasons, when water was plentiful, those who came down to drink at the Waingunga--or anywhere else, for that matter--did so at the risk of their lives, and that risk made no small part of the fascination of the night’s doings. To move down so cunningly that never a leaf stirred; to wade knee-deep in the roaring shallows that drown all noise from behind; to drink, looking backward over one shoulder, every muscle ready for the first desperate bound of keen terror; to roll on the sandy margin, and return, wet-muzzled and well plumped out, to the admiring herd, was a thing that all tall-antlered young bucks took a delight in, precisely because they knew that at any moment Bagheera or Shere Khan might leap upon them and bear them down. But now all that life-and-death fun was ended, and the Jungle People came up, starved and weary, to the shrunken river--tiger, bear, deer, buffalo, and pig, all together--drank the fouled waters, and hung above them, too exhausted to move off. The deer and the pig had tramped all day in search of something better than dried bark and withered leaves. The buffaloes had found no wallows to be cool in, and no green crops to steal. The snakes had left the Jungle and come down to the river in the hope of finding a stray frog. They curled round wet stones, and never offered to strike when the nose of a rooting pig dislodged them. The river-turtles had long ago been killed by Bagheera, cleverest of hunters, and the fish had buried themselves deep in the dry mud. Only the Peace Rock lay across the shallows like a long snake, and the little tired ripples hissed as they dried on its hot side. It was here that Mowgli came nightly for the cool and the companionship. The most hungry of his enemies would hardly have cared for the boy then. His naked hide made him seem more lean and wretched than any of his fellows. His hair was bleached to tow colour by the sun; his ribs stood out like the ribs of a basket, and the lumps on his knees and elbows, where he was used to track on all fours, gave his shrunken limbs the look of knotted grass-stems. But his eye, under his matted forelock, was cool and quiet, for Bagheera was his adviser in this time of trouble, and told him to go quietly, hunt slowly, and never, on any account, to lose his temper. Mowgli laughed. “Yes, we be great hunters now,” said he. “I am very bold--to eat grubs,” and the two came down together through the crackling undergrowth to the river-bank and the lace-work of shoals that ran out from it in every direction. On the level plain of the farther bank the stiff jungle-grass had died standing, and, dying, had mummied. The beaten tracks of the deer and the pig, all heading toward the river, had striped that colourless plain with dusty gullies driven through the ten-foot grass, and, early as it was, each long avenue was full of first-comers hastening to the water. You could hear the does and fawns coughing in the snuff-like dust. Upstream, at the bend of the sluggish pool round the Peace Rock, and Warden of the Water Truce, stood Hathi, the wild elephant, with his sons, gaunt and grey in the moonlight, rocking to and fro--always rocking. Below him a little were the vanguard of the deer; below these, again, the pig and the wild buffalo; and on the opposite bank, where the tall trees came down to the water’s edge, was the place set apart for the Eaters of Flesh--the tiger, the wolves, the panther, the bear, and the others. “We wish so, very greatly,” bleated a young fawn, who had only been born that spring, and did not at all like it. Wretched as the Jungle People were, even Hathi could not help chuckling; while Mowgli, lying on his elbows in the warm water, laughed aloud, and beat up the scum with his feet. “Well spoken, little bud-horn,” Bagheera purred. “When the Truce ends that shall be remembered in thy favour,” and he looked keenly through the darkness to make sure of recognising the fawn again. Gradually the talking spread up and down the drinking-places. One could hear the scuffling, snorting pig asking for more room; the buffaloes grunting among themselves as they lurched out across the sand-bars, and the deer telling pitiful stories of their long foot-sore wanderings in quest of food. Now and again they asked some question of the Eaters of Flesh across the river, but all the news was bad, and the roaring hot wind of the Jungle came and went between the rocks and the rattling branches, and scattered twigs, and dust on the water. “It will pass, it will pass,” said Hathi, squirting water along his back and sides. “We have one here that cannot endure long,” said Baloo; and he looked toward the boy he loved. “Nay, I meant no harm, Baloo; but only that thou art, as it were, like the coconut in the husk, and I am the same coconut all naked. 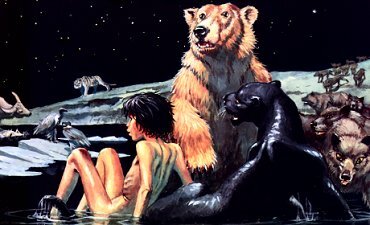 Now that brown husk of thine--” Mowgli was sitting cross-legged, and explaining things with his forefinger in his usual way, when Bagheera put out a paddy paw and pulled him over backward into the water. “And what is that?” said Mowgli, off his guard for the minute, though that is one of the oldest catches in the Jungle. “Break thy head,” said Bagheera quietly, pulling him under again. “It is not good to make a jest of thy teacher,” said the bear, when Mowgli had been ducked for the third time. The Lame Tiger had dipped his chin and jowl in the water, and dark, oily streaks were floating from it down-stream. “Man!” said Shere Khan coolly, “I killed an hour since.” He went on purring and growling to himself. The line of beasts shook and wavered to and fro, and a whisper went up that grew to a cry. “Man! Man! He has killed Man!” Then all looked towards Hathi, the wild elephant, but he seemed not to hear. Hathi never does anything till the time comes, and that is one of the reasons why he lives so long. “At such a season as this to kill Man! Was no other game afoot?” said Bagheera scornfully, drawing himself out of the tainted water, and shaking each paw, cat-fashion, as he did so. Bagheera’s back began to curve like a bamboo in a high wind, but Hathi lifted up his trunk and spoke quietly. “Thy kill was from choice?” he asked; and when Hathi asks a question it is best to answer. “Even so. It was my right and my Night. Thou knowest, O Hathi.” Shere Khan spoke almost courteously. The last words rang out like silver trumpets, and Hathi’s three sons rolled forward half a pace, though there was no need. Shere Khan slunk away, not daring to growl, for he knew--what every one else knows--that when the last comes to the last, Hathi is the Master of the Jungle. Mowgli waited for a minute to pick up his courage, because no one cared to address Hathi directly, and then he cried: “What is Shere Khan’s right, O Hathi?” Both banks echoed his words, for all the People of the Jungle are intensely curious, and they had just seen something that none except Baloo, who looked very thoughtful, seemed to understand. There was a minute or two of pushing a shouldering among the pigs and the buffalo, and then the leaders of the herds grunted, one after another, “We wait,” and Hathi strode forward, till he was nearly knee-deep in the pool by the Peace Rock. Lean and wrinkled and yellow-tusked though he was, he looked what the Jungle knew him to be--their master. “Ye know, children,” he began, “that of all things ye most fear Man“; and there was a mutter of agreement. “This tale touches thee, Little Brother,” said Bagheera to Mowgli. “It has not lost fat in the telling,” Bagheera whispered, and Mowgli laughed behind his hand. “In those days there was no corn or melons or pepper or sugar-cane, nor were there any little huts such as ye have all seen; and the Jungle People knew nothing of Man, but lived in the Jungle together, making one people. But presently they began to dispute over their food, though there was grazing enough for all. They were lazy. Each wished to eat where he lay, as sometimes we can do now when the spring rains are good. Tha, the First of the Elephants, was busy making new jungles and leading the rivers in their beds. He could not walk in all places; therefore he made the First of the Tigers the master and the judge of the Jungle, to whom the Jungle People should bring their disputes. In those days the First of the Tigers ate fruit and grass with the others. He was as large as I am, and he was very beautiful, in colour all over like the blossom of the yellow creeper. There was never stripe nor bar upon his hide in those good days when this the Jungle was new. All the Jungle People came before him without fear, and his word was the Law of all the Jungle. We were then, remember ye, one people. “Yet upon a night there was a dispute between two bucks--a grazing-quarrel such as ye now settle with the horns and the fore-feet--and it is said that as the two spoke together before the First of the First of the Tigers lying among the flowers, a buck pushed him with his horns, and the First of the Tigers forgot that he was the master and judge of the Jungle, and, leaping upon that buck, broke his neck. At this Tha laughed, and said, ‘So be it,’ and went away very angry. “Children, ye know the Grey Ape. He was then as he is now. At the first he made a wise face for himself, but in a little while he began to scratch and to leap up and down, and when Tha came back he found the Grey Ape hanging, head down, from a bough, mocking those who stood below; and they mocked him again. And so there was no Law in the Jungle--only foolish talk and senseless words. “Ugh!” said Mysa, the leader of the buffaloes, from their sand-bank. “Yes, Mysa, it was the buffaloes. They came back with the news that in a cave in the Jungle sat Fear, and that he had no hair, and went upon his hind legs. Then we of the Jungle followed the herd till we came to that cave, and Fear stood at the mouth of it, and he was, as the buffaloes had said, hairless, and he walked upon his hinder legs. When he saw us he cried out, and his voice filled us with the fear that we have now of that voice when we hear it, and we ran away, tramping upon and tearing each other because we were afraid. That night, so it was told to me, we of the Jungle did not lie down together as used to be our custom, but each tribe drew off by itself--the pig with the pig, the deer with the deer; horn to horn, hoof to hoof--like keeping to like, and so lay shaking in the Jungle. Mowgli chuckled quietly here, his chin in the water. “So loud did he howl that Tha heard him and said, ‘What is the sorrow?’ And the First of the Tigers, lifting up his muzzle to the new-made sky, which is now so old, said: ‘Give me back my power, O Tha. I am made ashamed before all the Jungle, and I have run away from a Hairless One, and he has called me a shameful name.’ ‘And why?’ said Tha. ‘Because I am smeared with the mud of the marshes,’ said the First of the Tigers. ‘Swim, then, and roll on the wet grass, and if it be mud it will wash away,’ said Tha; and the First of the Tigers swam, and rolled and rolled upon the grass, till the Jungle ran round and round before his eyes, but not one little bar upon all his hide was changed, and Tha, watching him, laughed. Then the First of the Tigers said: ‘What have I done that this comes to me?’ Tha said, ‘Thou hast killed the buck, and thou hast let Death loose in the Jungle, and with Death has come Fear, so that the people of the Jungle are afraid one of the other, as thou art afraid of the Hairless One.’ The First of the Tigers said, ‘They will never fear me, for I knew them since the beginning.’ Tha said, ‘Go and see.’ And the First of the Tigers ran to and fro, calling aloud to the deer and the pig and the sambhur and the porcupine and all the Jungle Peoples, and they all ran away from him who had been their judge, because they were afraid. “They throw a thing that cuts now,” said Ikki, rustling down the bank; for Ikki was considered uncommonly good eating by the Gonds--they called him Ho-Igoo--and he knew something of the wicked little Gondee axe that whirls across a clearing like a dragonfly. “Ahi! Aoo!” said the deer, thinking of what it all meant to them. “For one night only does Man fear the Tiger?” said Mowgli. “For one night only,” said Hathi. The deer grunted sorrowfully and Bagheera’s lips curled in a wicked smile. “Do men know this--tale?” said he. Hathi dipped his trunk into the water as a sign that he did not wish to talk. “The trees and the creepers marked him, Little Brother, and made him the striped thing that we see. Never again would he eat their fruit; but from that day he revenged himself upon the deer, and the others, the Eaters of Grass,” said Baloo. Just to give you an idea of the immense variety of the Jungle Law, I have translated into verse (Baloo always recited them in a sort of sing-song) a few of the laws that apply to the wolves. There are, of course, hundreds and hundreds more, but these will do for specimens of the simpler rulings. But kill not for pleasure of killing, and seven times never kill Man. One haunch of each kill for her litter, and none may deny her the same.